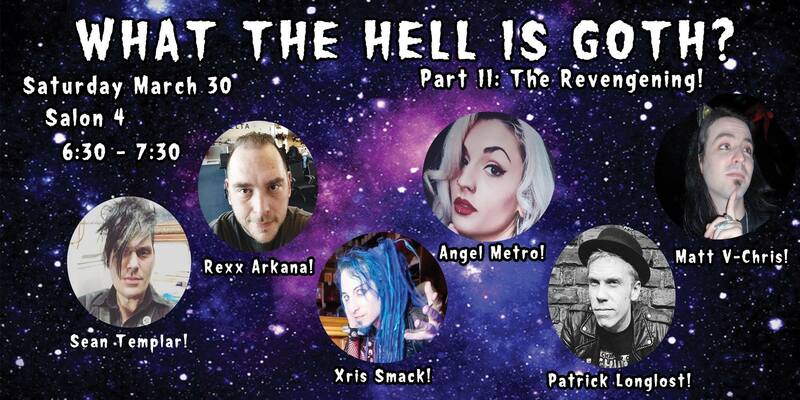 WHAT THE HELL IS GOTH II: THE REVENGENING! The question has been plaguing scholars and madmen for millenia! Once again, we will probe deep and hard at this, the most complex of questions. Please join our Panel of the Damned as we laugh, cry and most likely cry some more. Afterwards, there will be a Q&A for the panel (time permitting). :Angel Metro, Dark Side of the Con, Deathrock, Goth, Gothic, Gothic Rock, Sean Templar, The Long Losts, Xris SMack!